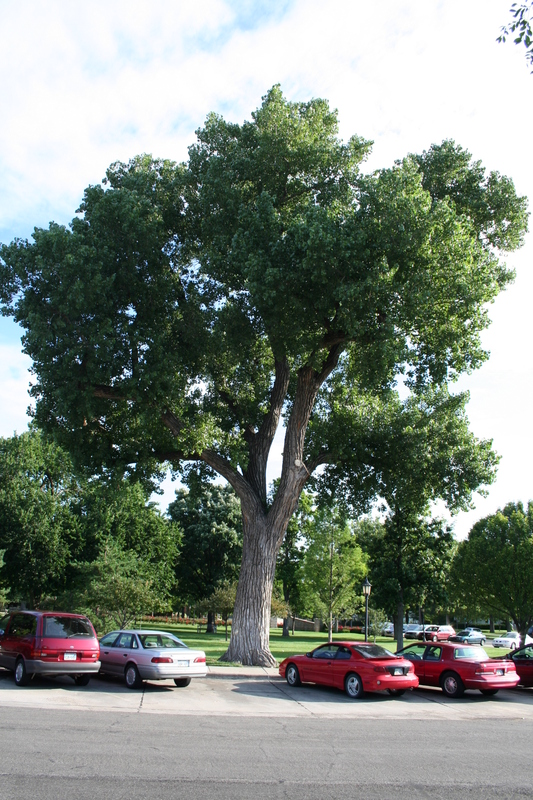 Eastern cottonwood is the state tree of Nebraska and can grow in great abundance along streams and rivers and other wet areas. Cottonwood makes its best growth on moist, well-drained, fine sandy loams or silt loams. Coarse sands and heavy clay soils are not satisfactory. Though no longer in favor by most homeowners, this tree is well-suited for acreages, farms, parks, and natural areas. The cottonwood is a fast grower, is resilient to temperature extremes, offers wide-spreading shade and, can have a nice golden-yellow fall color. It is a relatively short-lived tree, seldom surviving for more than 80 years. The leaves are broadly triangular, ovate in outline, 3 to 5 inches long and nearly as wide. They are dark green, lustrous above, and paler and smooth beneath. The marginal teeth are somewhat hooked, being larger toward the leaf base and smaller toward the pointed tip. Twigs are rather stout, round, and distinctly enlarged at the nodes. The conical, pointed buds are smooth, glossy, and olive-brown to reddish-brown in color. The bark of younger trees is rather smooth and greenish-gray. On older trunks, it becomes ashy-gray and is roughened by long, deep, longitudinal and interconnecting furrows. Seedlings and young trees are browsed by rabbits, deer, and domestic stock. Beavers use saplings and poles for food and dam construction. It is also vitally important to many important bird and insect species. Though many seedless cultivars of the tree exist, few offer enough positive attributes to recommend them for planting. Instead, the best trees for planting are those that are grown from native seed or that occur naturally nearby. Just dig up a seedling or start one from a cutting in late winter. Native Americans held cottonwood in high regard and it is thought that the leaves, fashioned into teepees by native children, were the inspiration for the teepee dwellings of the plains tribes. Our state's Champion cottonwood is also the National Champion. It's near Beatrice!